"The eggs are delicious, and it's easy to make more for larger gatherings. I've added onion and celery for a little more flavor and texture." Slice eggs in half lengthwise and remove yolks; set whites aside. Mash yolks with a fork in a small bowl. Stir in mayonnaise, sugar, vinegar, mustard, salt, onion, and celery; mix well. Stuff or pipe egg yolk mixture into egg whites. Sprinkle with paprika. Refrigerate until serving. 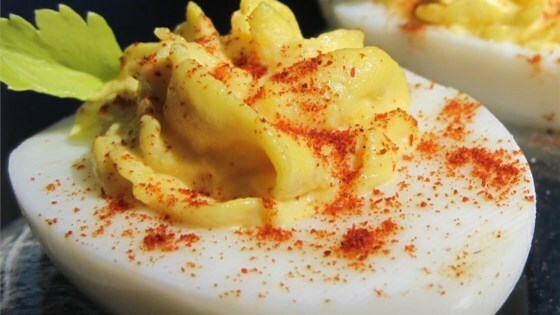 Though a simple recipe, these eggs are devilishly delicious! The mixture of sugar and salt is unpleasant. Also, I don't think it needs the vinegar. Too much going on here...these are not at all "simple"!